The exhibition and its catalogue were overseen by Constance De Jong with the assistance of Tania Cross, Christopher Howard, Colin Kim, Rachel Liebowitz, Justin Matherly, Andrea Merkx, Lauren O’Neill-Butler, Rotem Ruff, and Hugh Walton. Renowned since the early 1960s for his sculptures and critical writings, [Robert] Morris was involved in the E.A.T. (Experiments in Art and Technology) project, when he briefly worked in film and video. He employed structural devices such as layering, framing, and mirroring in an examination of video’s distinct characteristics and its use as a means of communication. I exchanged videos with [Lynda] Benglis. We used each other’s videos as material to make our own works. The resultant works are separate: what she made is hers; what I made (Exchange) is mine. The exchanged tapes are part of the works insofar as they are incorporated into the finished tapes (hers and mine). It is not necessary to view the prior tapes to make judgments of the finished works—either hers or mine. Exchange is not a fragment, although it could have become part of an extended process—i.e., more finished tapes could have been made by continuing the process. The written text (read in Exchange) is just that: a written text. The video, which includes the text, is what it is. I made more films than videos. I preferred looking at the larger screen of film and did not like the single monitor. Interviewed on November 11, 2005 via email by Christopher Howard. 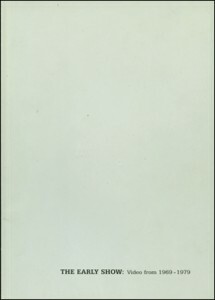 Originally published in Constance De Jong, ed., The Early Show: Video from 1969–1979 (New York: Bertha and Karl Leubsdorf Gallery, Hunter College, City University of New York, 2006), 48–49.